This week’s podcast comes at the beginning of December and for many of us, that means the hustle and bustle of the holiday time is upon us. Our to-do lists double in size. We find ourselves shopping at the mall – Eeek! We are cramming in time to send cards, clean the house, prep for parties, etc. And it can become SO easy to lose ourselves to the stress and forget what the holidays are supposed to be about. So this week’s podcast is completely different from any I have done before. This week, I share my story and how a few years ago a simple birthday practice blossomed into a month long practice for my family. We call it “The 25 days of Kindness” or sometimes we call it the Kindness Advent Calendar. In the podcast (or the transcript below), I explain how my battle with cancer a few years ago inspired the idea of doing my December birthday differently from the moment of being cancer-free onward. And how this birthday practice transitioned into a month-long practice for my entire family that has transformed us and many others. 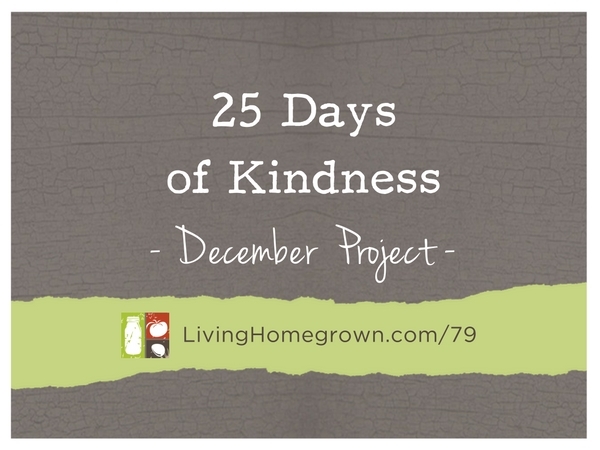 I really want to encourage you to give this Kindness Project a try this month. For us, it is the antidote to the hustle. It puts things in perspective and makes my kids slow down and understand the importance of giving rather than receiving. When we do one random act of kindness, we never know the impact it can have. It was such a simple thing that he did and he probably didn’t give it thought. But it meant the world to me and I think of him (and thank him in my heart) daily for it. To help you create your own 25 days kindness practice, I’ve created a free PDF that you can download below. It includes 30 kindness prompts (so you can pick the ones that feel right to you) and a sheet of explanation cards you can use with your random acts. Just download the free PDF. 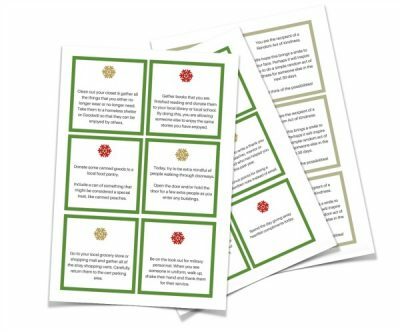 Use the cards as you would an Advent Calendar by picking one card each day as you count down to your holiday. Or if you have kids, you can place one card inside 25 different envelopes. Your kids can open one envelope each day and act on that day’s card. Each prompt is simple and easy. Most do not require you to spend any money, but I included a few giving cards as well. At our house, we post the finished cards on our refrigerator to keep track of the days we have completed. Then, at the end of the month you can reflect back on your month long commitment to kindness. Do you have any other tips and ideas of Random Acts of Kindness? Share them below! One more great act of kindness… sharing this with all of us. I have always tried to notice people needing assistance and help them. It is second nature. It is even better to act outside the box and go beyond daily experience as you and your family have done. What a truly great woman you are. Keep up the excellent work. Wow – Thank you Craig!